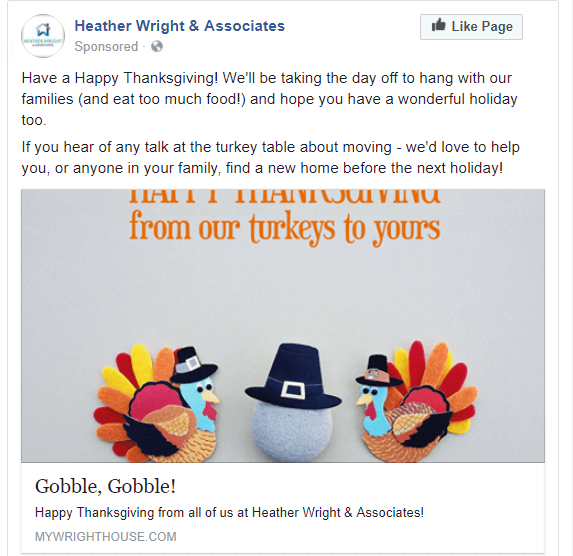 This year, I noticed a LOT of real estate agents getting swept away in the social media sea of opportunities and using the holiday to generate business. It seemed like a decent idea, and I even jumped on the bandwagon myself. But then, I realized that we’re all doing it wrong. 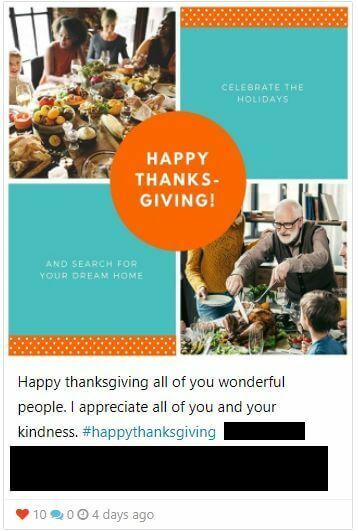 When you try to combine a sincere message “Have a Happy Thanksgiving” with “and remember I’m your Realtor” or some similar sentence, you’re missing the mark. By adding a sales pitch, you’re negating any and all sincerity of the message. On this example, the person posting the image didn’t include a message of their own – it was just the image. 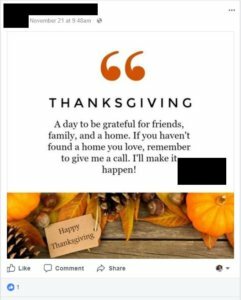 And, you can see that the image is more about the agent than it is about Happy Thanksgiving wishes. This image is a little better because they included a personal message that wasn’t asking for business. But, the image mentions “and search for your dream home”. What does that really have to do with a Happy Thanksgiving? Nothing – it’s the inserted sales message that ruins the holiday greeting. See, I jumped on the holiday bandwagon too! If the message had ended after the first sentence, it would have been just fine. But, it’s ruined with the second sentence – asking for business on a holiday greeting. Oops! Now, you might be thinking that we’re salespeople so this is totally OK. In fact, you might think it’s necessary for us to remind our audience at every turn that we can help them buy or sell a house. Some of that is true. We are sales people. And, staying top of mind for real estate needs is certainly a marketing priority. If you’re really, truly thankful for someone – just say that. Don’t make it about you. When you take a heartfelt message and turn it around to being about you or your business – it’s just another sales message that people will ignore. Today I’m giving thanks for all the wonderful people in my life. And, I hope you and your family have a Happy Thanksgiving. The holidays always make me think about what really matters. I have so much gratitude for my family, my friends, my business – my cup overflows and I’m grateful for you. It’s ok to make light and joke that all you want from Santa is another 3 closings. But, ON the holiday – just keep it sincere. You can’t go wrong with sincerity. When you offer a heartfelt message that’s totally sincere, then people are going to remember that you’re a lovely person. The goal is to endear yourself to them – and you do that with sincerity. So, I’m reminding myself of this lesson and sharing it with you. The next time you have heartfelt holiday sentiments to share – don’t add on anything tacky about your business.